When it comes to decorating your home, one of the most important elements to consider is the walls. They are the largest, most visible component in the space; therefore, the treatment that you apply on them will have a considerable effect on the overall feeling of an interior space. 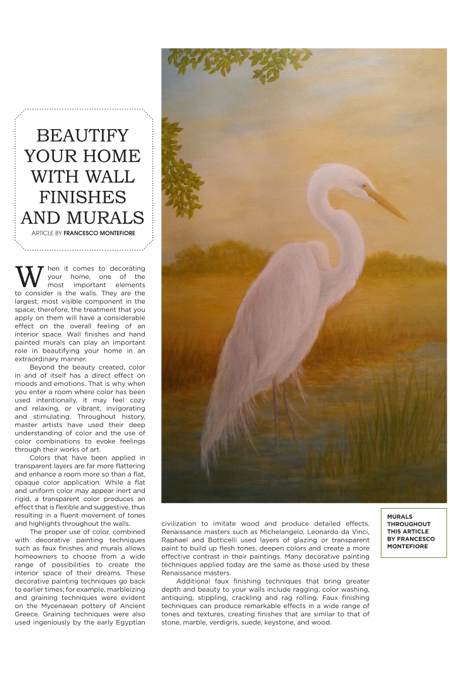 Wall finishes and hand painted murals can play an important role in beautifying your home in an extraordinary manner. Beyond the beauty created, color in and of itself has a direct effect on moods and emotions. That is why when you enter a room where color has been used intentionally, it may feel cozy and relaxing, or vibrant, invigorating and stimulating. Throughout history, master artists have used their deep understanding of color and the use of color combinations to evoke feelings through their works of art. Colors that have been applied in transparent layers are far more flattering and enhance a room more so than a flat, opaque color application. While a flat and uniform color may appear inert and rigid, a transparent color produces an effect that is flexible and suggestive, thus resulting in a fluent movement of tones and highlights throughout the walls. The proper use of color, combined with decorative painting techniques such as faux finishes and murals allows homeowners to choose from a wide range of possibilities to create the interior space of their dreams. These decorative painting techniques go back to earlier times; for example, marbleizing and graining techniques were evident on the Mycenaean pottery of Ancient Greece. Graining techniques were also used ingeniously by the early Egyptian civilization to imitate wood and produce detailed effects. Renaissance masters such as Michelangelo, Leonardo da Vinci, Raphael and Botticelli used layers of glazing or transparent paint to build up flesh tones, deepen colors and create a more effective contrast in their paintings. Many decorative painting techniques applied today are the same as those used by these Renaissance masters. Additional faux finishing techniques that bring greater depth and beauty to your walls include ragging, color washing, antiquing, stippling, crackling and rag rolling. Faux finishing techniques can produce remarkable effects in a wide range of tones and textures, creating finishes that are similar to that of stone, marble, verdigris, suede, keystone, and wood. An artistic application that has increased in popularity through the years is one that produces the time-weathered effect that can be seen on Tuscan walls. For this type of paint finish, earthy colors such as sienna and ochre are blended, creating a unique feeling of warmth and softness. An alternative approach, which results in a rich and luxurious wall finish, is achieved through the use of Venetian plaster. The outcome is a vibrant and luminous finish that is accomplished without the use of paint. Venetian plaster is composed of a lime-based plaster mixed with marble powder. It is applied in very thin layers, creating a marble-like finish unlike any other. Venetian plaster has been used by master artisans for many centuries. It is soft to the touch and can be applied to obtain either a glossy, low luster or non-gloss finish. Wall finishes transform ordinary walls into a beautiful living space and produce a unique ambience. They can be seen around the world in private homes, hotels, resorts and high end commercial properties. The combination of decorative painting techniques, colors and textures that can be chosen are limitless. Murals have been a well-regarded form of art for many centuries. They have been observed as cave paintings and are very likely the oldest art form. One of the earliest recorded examples is approximately 32,000 years old and was found on the walls of the Chauvet cave in France. Throughout time, the painting of murals was used by various cultures, including the Egyptian, Greek, and Roman, as a form of artistic expression within their dwellings. French and Italian muralists gifted us with elaborate murals that, to this day, are still intact; one of the most famous is Michelangelo’s mural on the ceiling of the Sistine Chapel. In present times, hand painted murals are used to embellish the interiors of homes and commercial spaces. They offer us an escape from a uniform, routine environment and open up new possibilities for decorating interiors. A professional well-painted mural has the capacity to spark the imagination and create the illusion of greater space in your room. The representation of beautiful views can bring into your living area a tropical island, a romantic Italian garden, the splendor of snowy mountains, an exotic jungle scene, the Savannah marshlands or a delightful children’s theme—to name a few. And when you want to give the illusion of an open ceiling, what better than a painted sky with clouds? Francesco Montefiore is an artist specializing in murals, wall finishes and fine art. Art Classico by Francesco Montefiore has been commissioned to complete projects for Royal Caribbean, Ritz Carlton Hotel, Trump Towers, La Gorce Country Club and for many private residences and homes in the United States. Internationally-based in Miami for the past 20 years, he is now in Savannah. For more information, visit ArtClassico.com.